The Opticron HR80 Angled ED, outstanding low-light performance due to its enormous 80mm objective lens and excellent colour rendition due to its ED glass. With an ED or "extra low dispersion" glass element in the primary objective system, these spotting scopes provide a higher degree of colour correction when compared to conventional glass objectives. The ED glass becomes more apparent at higher magnifications and under certain difficult lighting conditions (e.g. when looking over water) the image appears sharper and colours remain truer to life across the magnification range. 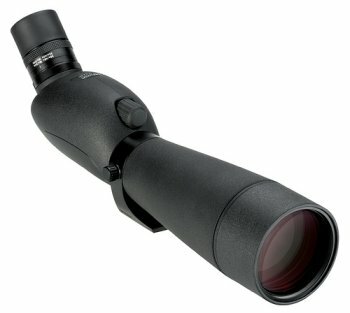 The large objective facilitates wide angle and high magnification eyepieces. The HR80 has a minimum focus of just 8m, is nitrogen filled and has a 30 year guarantee. Opticron HR80 spotting scopes are sold as bodies (without eyepieces), an eyepiece is needed in addition to the scope itself.